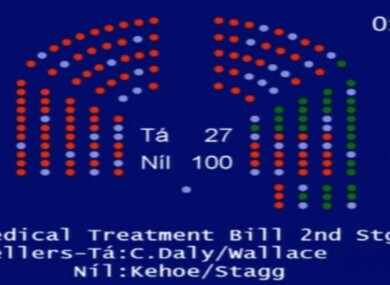 How the Dáil voted on the abortion bill, the light blue dots are the absent members. ON WEDNESDAY NIGHT, the Dáil voted down legislation proposed by the United Left Alliance TD Clare Daly to provide for abortion in circumstances where there is a risk to the life of a pregnant woman. The government had made clear its intentions to vote down the legislation as it currently considers bringing forward its own measures to respond to the expert group report on the European Court of Human Rights ruling in the A, B and C versus Ireland case two years ago. A total of 128 TDs voted last night with 101 voting against the bill and 27 voting in favour of it, leaving 38 TDs who did not vote, all for a variety of reasons which TheJournal.ie has been attempting to establish today and here is what we’ve found out. Firstly, the Ceann Comhairle Seán Barrett, abstained from the vote in keeping with the mandate of his office to observe strict impartiality and to not participate or vote in any debates except in the event of a tie. Of the government TDs – that is any TD from Fine Gael and the Labour Party who has not lost the whip – who did not vote it has been confirmed that they had permission to miss the vote from the whip’s office. In most situations government ministers who missed the vote will have a pair on the opposition benches who will not vote in order to off-set the ministerial absence. This is known as ‘pairing’. It could not be confirmed for definite if pairing was the reason for the absence of some Fianna Fáil TDs including Micheál Martin, Seán Fleming, Willie O’Dea, and Robert Troy. As for the rest, Fine Gael TD and Jobs Minister Richard Bruton was at an engagement with IDA Ireland and a client company, the Department of Jobs said. The two Ministers of State from that department were also otherwise engaged with Labour TD Seán Sherlock granted a pairing by the chief whip. “The Minister has said that for the record he would have voted with the Government had he been in the Dáil,” the Department of Jobs said. Fine Gael TD and Minister for Small Business, John Perry, was at the InterTradeIreland All Island Seedcorn Awards at the Titanic museum in Belfast. Fellow Fine Gael TD and Minister of State Fergus O’Dowd was attending a conferences in Limerick and Dublin. He told us that he was paired for the day but was “supporting fully” the position of the government on the issue. Fine Gael TD Catherine Byrne has been in hospital this week where she underwent surgery and she is currently recuperating for the next two weeks. Her fellow Fine Gael TD and Junior Minister Ciarán Cannon is on an education mission to India from which he returns later this week. Minister of State at the Department of Foreign Affairs and Labour TD Joe Costello was speaking at an Irish Aid event to mark World Aids Day at the University of Limerick and was paired a spokesperson said. Labour TD Anne Ferris is currently recovering from recent surgery and has not been in the Dáil for the past few weeks. Fine Gael TD and party chairman Charlie Flanagan was at a “long-standing meeting” in his capacity as party chairman but said that he would have voted against the proposed legislation in anticipation of the government’s decision on introducing its own measures before the end of the year. Independent TD Shane Ross was with his wife who had just left hospital following recent surgery. Labour TD Dominic Hannigan was doing an interview with TV3 that was pre-recorded for a future edition of Midweek. Fine Gael TD and Environment Minister Phil Hogan was on “official business” as was his fellow minister at the Department of Environment and Labour TD Jan O’Sullivan, the Department said. Fine Gael TDs Tom Hayes and John O’Mahoney were on “private, government business” at the British Embassy in Dublin according to Hayes with Labour TD Colm Keaveney also joining them. Taoiseach and Fine Gael TD Enda Kenny was not in the Dáil last night and does not normally vote on Private Members’ business, instead attending to government business on a Wednesday evening. Only in cases where there is a no confidence motion might the Taoiseach vote on such matters. Minister of State for European Affairs and Fine Gael TD Lucinda Creighton was attending an event with the Taoiseach, a spokesperson said. Labour TD Michael McCarthy is in Mozambique with the Public Accounts Committee this week where he is joined by Fianna Fáil TD and PAC chairman John McGuinness and Fine Gael TD John Deasy. Independent TD Finian McGrath was unable to vote having been ejected from the Dáil by the Ceann Comhairle during Leaders’ Questions yesterday. McGrath said that he was told by the Ceann Comhairle that he was suspended for one-day, meaning he could not participate in last night’s debate. But McGrath said that his position on the X Case is that he favours legislation and regulations. Fine Gael TD Olivia Mitchell said she was attending a constituency event she had committed to, planting a tree at the Bloomfield Nursing Home in Rathfarnham which was celebrating its 200th anniversary. Mitchell said she was standing in for junior minister Kathleen Lynch who did vote in the Dáil last night and was listed to attend the event. Mitchell said she has already spoken about her position on the issue and favours legislation and regulations to deal with the X Case. Denis Naughten, who lost the Fine Gael whip last year, had a family bereavement and could not attend the vote. He added that he would not be rushed into making up his mind about any abortion legislation and says he will come to an “informed decision” when he has fully digested the report of the expert group. Education Minister and Labour TD Ruairí Quinn was “otherwise engaged”, a spokesperson said adding that Quinn had made his position on the issue clear and would have voted with the government had he been there. Sinn Féin TD Peadar Tóibín was not in attendance despite the party imposing the whip on the motion which required TDs to vote in favour of it. It also meant that all TDs were expected to be in attendance for the vote. Tóibín could not be reached for comment and his whereabouts last night are not known. A Sinn Féin spokesperson said that this would be “something the party will have to deal with” as he wasn’t on any other party business. Independent TD Tom Fleming told TheJournal.ie on Friday that he was present in the Dáil for the debate on Wednesday and spoke but that he abstained on the vote. At the time of publication, independent deputy Noel Grealish did not return a request for comment. TheJournal.ie could not confirm the reasons for the absence of Public Expenditure and Reform Minister Brendan Howlin at the time of publication. Labour TD Derek Nolan could not be reached for comment and neither could Fine Gael TDs Tom Barry and Pat Breen. Email “Where were the 38 TDs who didn’t vote on the abortion bill?”. Feedback on “Where were the 38 TDs who didn’t vote on the abortion bill?”.